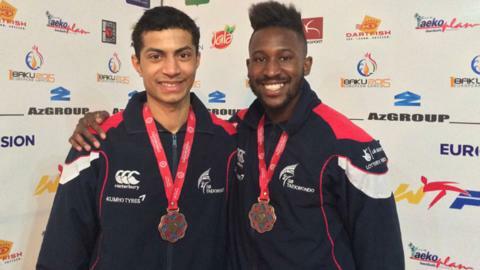 Third-place finishes for Ruebyn Richards and Andrew Deer gave British fighters their best ever medal haul at a European Taekwondo Championships. GB claimed eight medals in Azerbaijan, one more than in Manchester in 2012, once Aaron Cook's gold - in Isle of Man colours - is included. Richards and Alexey Denisenko were 5-5 after their -68kg semi-final, but the referee sent the Russian through. Deer (-74kg) lost 7-4 to another Russian, Albert Gaun. Bianca Walkden, 22, won her first European title with victory in the +73kg category on Friday, while Lutalo Muhammad and Asia Bailey secured bronze medals in the -87kg and -46kg categories respectively. On Saturday Olympic champion Jade Jones came second in the -57kg division, while Damon Samsun lost out to Cook in the -80kg final. Bronze for Richards on the final day of competition was the fighter's first major international honour. "Now it's sunk in a little I can't be disappointed with a medal, but being so close is frustrating," he said. Deer, who impressively defeated third-seed Raul Martinez Garcia 22-14 in the quarter-finals, added: "Gaun is a great performer and it was always going to be tough, but I'm pleased with my performances throughout the day. GB Taekwondo performance director Gary Hall was delighted with the achievements of his team, which came less than 12 months on from a disastrous World Championships at which no British fighters won medals. "It's good to see the team bounce back from the Worlds last year," Hall told BBC Sport. "The athletes and staff have worked hard since then to turn things around and to get so many medals - our best ever performance - is amazing." The next major event for the British team will be the first World Taekwondo Grand Prix event of the year, which takes place from 4-6 July in Suzhou, China.